George Townley Stubbs after George Stubbs. A fine stipple with etching, open-letter proof, engraved by George Townley Stubbs after his father's painting. A portrait of the stallion Volunteer, son of Eclipse, being approached by his groom, halter in hand. This horse is full of spirit and fire, and has given a fine opportunity to Mr Stubbs to display that ability he is so justly famed for. This horse is described in the attitude of avoiding the groom, who is endeavouring to catch him; there is something in the landscape particularly beautiful'. A subscription proposal in the same issue states that only one hundred of these proofs were to be issued. 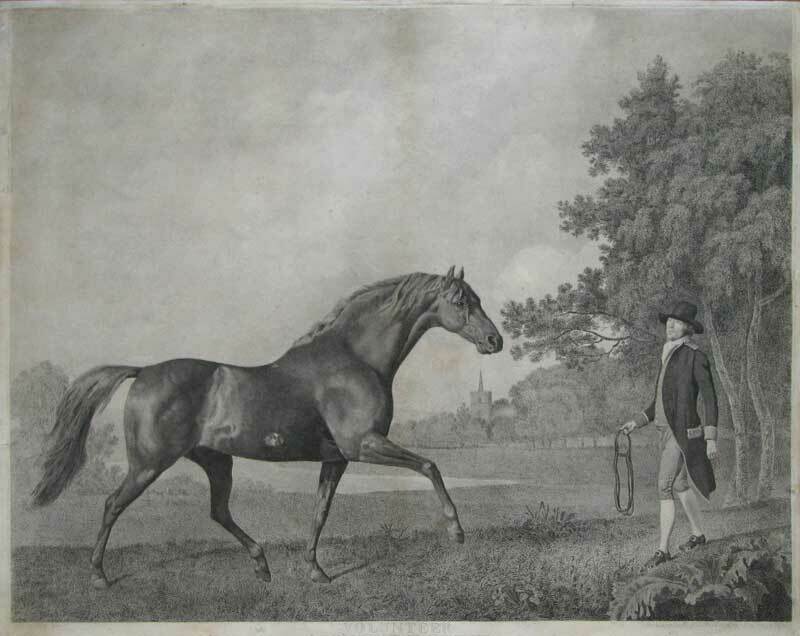 Lennox-Boyd et al: 'George Stubbs - The Complete Engraved Works', 116.